It was my first day working alongside Dr Tamara Russell. I had learnt about her work in conversation with my personal tutor, about options I might explore for an elective placement. This was part of my Mental Health Nursing degree at King’s College London, during which students are invited to arrange their own nursing placement for a month. I was saying how I’d like to learn more about alternative models of psychiatry and a mind-body approach to working with mental illness, and so she put me in touch with Tamara. 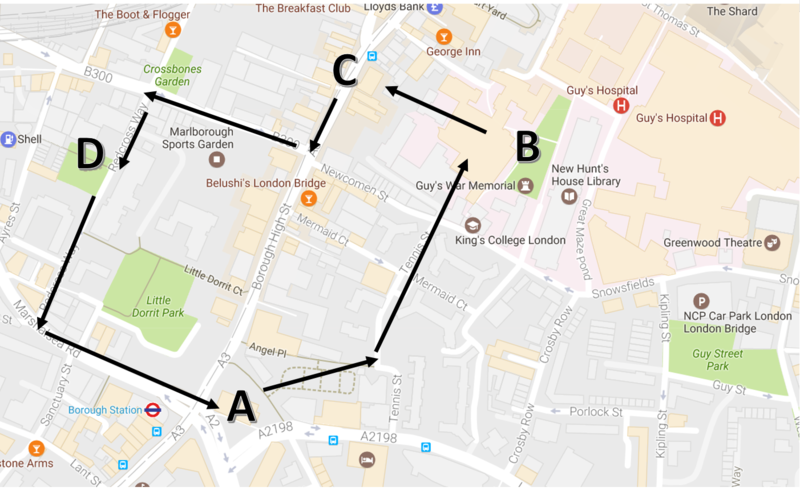 My curiosity was piqued when I received an email as to where we would meet on that first morning. Far removed from my previous nursing placements, in which I might already have started an early shift on a ward, I found myself, incongruously, riding my motorbike into South London in search of a farm! 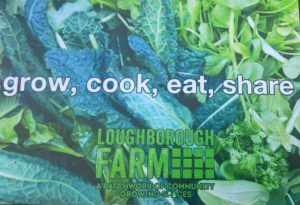 Situated only a short walk away from the Maudsley Hospital, nestled between the railway arches and a block of flats, Loughborough Farm is a community food growing project, that is part of a patchwork of growing spaces, utilising derelict or underused land around the Loughborough Junction area. I pulled up alongside the farm gates and its mural of a giant chaffinch, adorned by local tags in pen and paint, as the session inside was just getting under way. I knew Tamara would be running a mindfulness and tai-chi workshop for individuals attending a local recovery centre, hostel and GP surgeries. There were those who were using these services and also those who provide them (nurses, OTs and peer supporters) also participated. What struck me immediately as I quietly joined the group, was that I had no idea who was who. Everyone together was interested in well-being. Having received my training thus far within the ranks of the NHS and mainstream psychiatry where that divide between “them” and “us” is always starkly obvious, and sometimes damagingly so, I resisted an erroneously deemed necessary habit of identifying who was who. Tamara’s work very much embodies an ethos of “doing with” instead of “doing to”, championed by the likes of the Mental Fight Club (MFC) of the Dragon Cafe in Southwark, and their RE:CREATE psychiatry project . Here we were, just people, in thick jackets, practicing tai-chi among seedlings and saplings, on a chilly March morning. 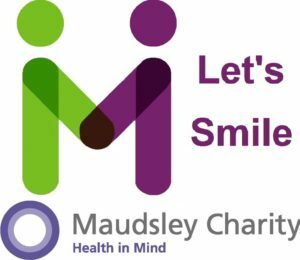 Furthermore, some of Dr Russell’s mindfulness training programmes are designed equally to be used by the health prof essionals themselves, whether they be doctors, support workers or nurses. They have been developed in recognition of that very patient-professional divide, that notices how busy schedules and uneven power dynamics can lead to highly emotive and stressful interactions, and subsequent disengagement with the mental health services. A mindfulness practice can lead to more attentive and considered communication, helping to build better therapeutic relationships and achieving optimal recovery outcomes. 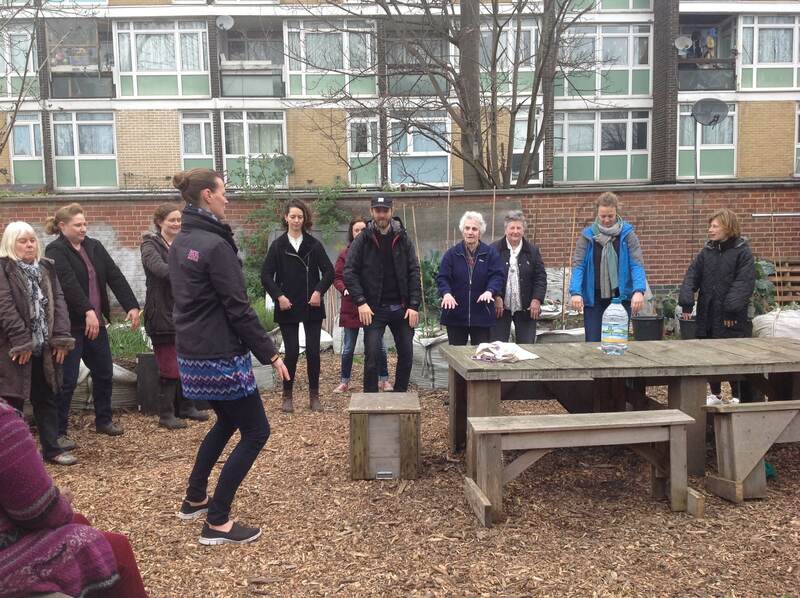 Tamara led us through some exercises used by Finnish soldiers to warm up our bodies! Her unselfconscious enthusiasm meant little smiles began appearing on the faces of those of us who thought we were here for serious meditation, as we shook our limbs and jiggled about. Then we were taken through a series of simple but powerful, slow-motion tai-chi postures, (explained in Dr Tamara Russel’s book, Mindfulness in Motion). Throughout we were invited to remain attuned to the subtle movements of our bodies, the movement of the air, the sound of a passing train, the birdsong. In doing so we were cultivating a valuable mindfulness of our environment and ourselves, that allows us to become aware of but not consumed by the background thoughts that constitute our conscious life. Whether we are worrying about all of the things we need to do, or concerns that might lead us to feel angry, sad or anxious, developing mindfulness can allow us to create a space between those thoughts and our emotional response to them. Connecting to the present moment through a mindfulness practice can be particularly beneficial in alleviating anxiety that is characterised by future planning, and depression of which excessive rumination is a feature. 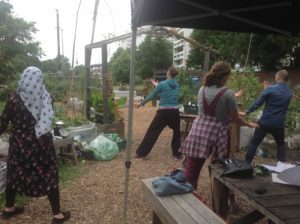 During one elegant tai-chi move, our arms spread eagle-like, we were invited to allow an open-hearted space for whatever concerns our minds might be clinging obstinately to, before encircling our arms in a compassionate acceptance of those concerns, feeling safe in the knowledge that our feet are planted firmly on the earth, (here on Loughborough Farm!). This is the Going Big Exercise from the Compassion Chapter of Tamara’s book Mindfulness in Motion. It is a way to use the body and movements to help the mind understand what we mean when we “go big” or “allow” even the most difficult feelings and emotions. After our practice everybody tucked into an incredible food-share consisting of quiches and salads made with fresh organic ingredients (not yet missing the NHS sustenance on this nursing placement!) before we mindfully planted tomato seeds ready for summer. 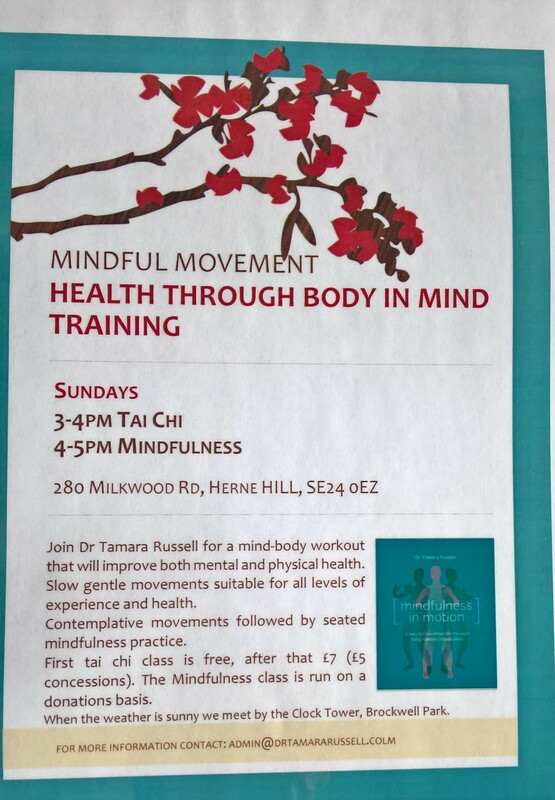 Information about Dr Tamara Russell’s tai-chi, kung-fu and mindfulness classes can be found here. Classes start back on Jan 31st 2018. Funding for Mindfulness at the Farm provided by the Let’s Smile Campaign, Maudsley Charity. 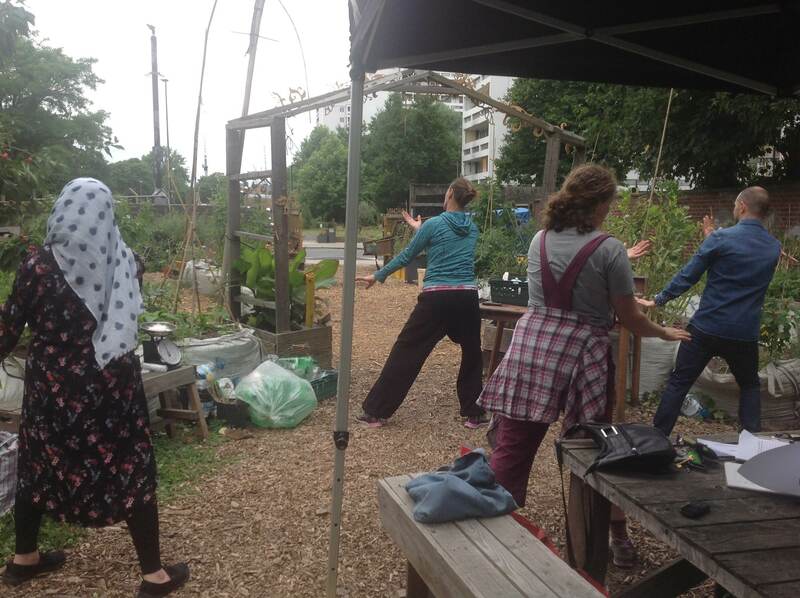 Tamara helped participants to explore the seasons through their senses and the moving body. 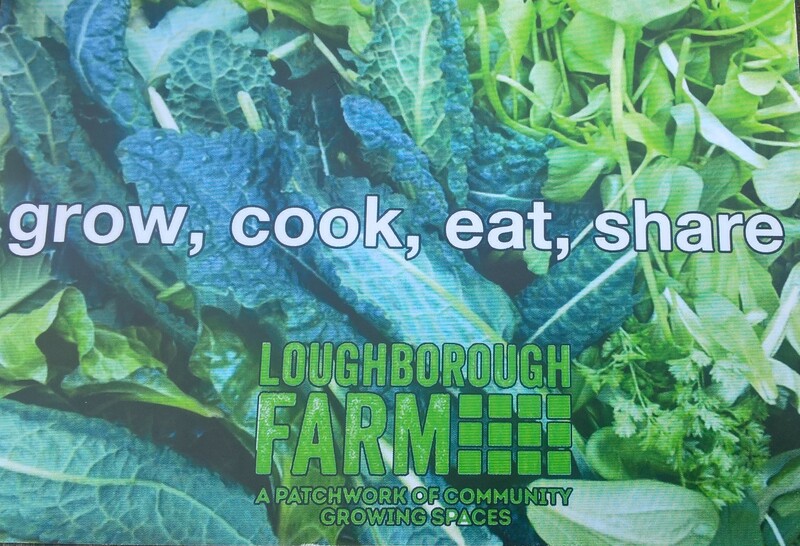 Thanks to Karen Hooper and the team at Loughborough Farm. Previous post Take a Mindful Breath ….